If you compare Idle Factory Tycoon game with other Idle games such as Idle Miner Tycoon, Make More, Adventure Capitalist, and more, then you will rate it better. The reason behind its popularity and ratings is its addictive gameplay. And it is not polluted with ad system; you don’t need to watch the ad every minute. In this post, we have covered some amazing Idle Factory Tycoon tips cheats and tricks and using these cheats & tips, you can easily earn a huge amount of Idle cash every minute. 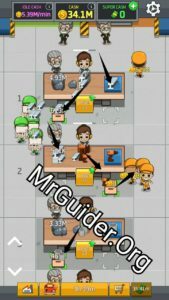 Before we move to Idle Factory Tycoon cheats tips, let’s start the Idle Factory Tycoon guide first. 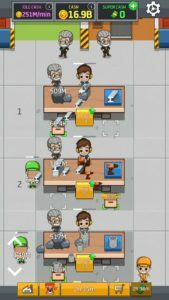 As usual, Idle Factory Tycoon game starts with a tutorial in which you learn about the basic of the game; how to play, about workers, managers, and products. What’s your goal? Your goal is to unlock all production factories and workshop. To accomplish this task, you need a huge amount of Idle cash which you can easily earn by using our Idle Factory Tycoon cheats and tips. In this part, we will talk about the inflow and outflow of produced goods, how to increase the amount of Idle cash per minute, a better upgrading scheme, rate of the products, and how to use super cash like a pro! These raw materials used in producing other goods such as steel bars, cans, batteries, MP 3 players, and much more. Workers at warehouse pick these raw materials and send to the workshop. At the beginning of the game, only Iron Ore material is unlocked. You have to spend a huge amount of money to unlock new material. The workers at warehouse send these raw materials to those workshops where the material is required to produce a specific product. For instance, Iron Ore used in making steel bars, cans. Copper used in making batteries. You have unlocked many types of the workshop at your factory. 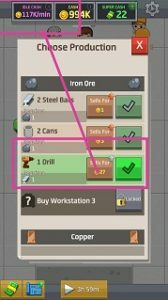 For instance, at workshop 1, you are producing steel bars. The player can change the product anytime by taping on product producing at a workshop. After it, tap on the tick mark next to a product you want to produce. Tip No. 1) Produce those goods which maximize your earnings. For instance, You earn 1 Idle cash per steel bar unit and 12 Idle cash per battery unit. So if you produce more batteries, you will earn more Idle cash. Now learn the sides. There are two sides next to your workshop; these sides determines how the products are using; as a raw material or for the market. If you tap on the left side, then all the units will be treated as raw material and if you tap on the right side, all the units will be sold directly in the market. For instance, you can sell steel bar directly in the market by keeping it on the right side or use it as raw material by keeping it to the left side. If you choose the left side, then workers of the warehouse will send the units to other workshops where steel bar is required to produce products. If you choose the right side, then all the workers at the market department will sell the units in the market. Treated as raw material? The steel bar is required to produce toaster. So if you are selling steel bar units on the market then you can not produce toaster. So keep the steel bar unit at left side so that workers at warehouse send the units to the workshop where steel bar is required. At workshop 4, we are making drill machines. To make drill machines, we need steel bars. Steel bars are producing at workshop 1. But if you are selling the steel bar directly to the market, then you can not make drill machines. So, use it as a raw material by keeping it to the left side so that workers transport the steel bars to the workshop 4. Look at the picture below, if I choose the drill machine, I can make 117K/minute. But if I choose cans on the same workshop, I can only make 32K/minute. The price of the battery is 10. And the price of a coffee machine is 20. Copper is required to make both these products. Now which one you choose? We have only 1 workshop. Obviously, Coffee Machine, because we can sell it at 20/per unit. In short, you have to focus on the product which can make more money for you. Update:- Now, you can earn free super cash after every 4 hours. Go to the shop -> under free super cash option -> watch the ad and get free super cash. Now, there is a separate tab for the product upgrade. Tap on it and you can upgrade a specific product using Idle Cash. Upgrade the products to make more money. Tip -> Upgrade those products which you are selling in the market. For instance, usually, we use steel bars as a raw material and we don’t sell it to market. So, don’t waste your coins on raw material upgrades. On the other hand, upgrade batteries, toaster, drill machine like products, which you sell in the market.